We’d love your help. Let us know what’s wrong with this preview of A Man of Shadows by Jeff Noon. To ask other readers questions about A Man of Shadows, please sign up. Brett Either would apply in my opinion, but on balance adult seems the most appropriate. This is a multi genre sci-fi thriller that is dark, intelligent, atmospheric and decidedly ambiguous. It is guaranteed to absorb and provoke thought. Jeff Noon engages in the heavily detailed world building of a city concealed amongst us by a dome. Half of the city, lit by lamps, exists in endless sunlight, and the other half in Dusk, wherein lies the odd and all the horrors of darkness. The two zones are connected by train. Within this weird world, time is money, a commodity to be traded and wh This is a multi genre sci-fi thriller that is dark, intelligent, atmospheric and decidedly ambiguous. It is guaranteed to absorb and provoke thought. Jeff Noon engages in the heavily detailed world building of a city concealed amongst us by a dome. Half of the city, lit by lamps, exists in endless sunlight, and the other half in Dusk, wherein lies the odd and all the horrors of darkness. The two zones are connected by train. Within this weird world, time is money, a commodity to be traded and where people exist in their own particular timelines making time both an obsession and a critical factor. The troubled PI, John Nyquist, languishes at the bottom of the ladder, when he is hired by the father of 18 year old runaway, Eleanor Bale, to find her. A search that finds him making connections with a dangerous serial killer, Quicksilver, notoriously killing openly, yet to all intents and purposes, an invisible man. A city all in man-made darkness, stars that never moved, where time is a relative thing, where industry collapses when certain pieces o I think this book should be proud to sit atop the "New Weird" label. A former professor of mine was fond of saying that great art is not merely engaged with, but surrendered to. That particular quality of experience – the willing submission of the viewer to the mastery of the art object itself – is hard to nail down in words; so then, is the absence of that quality. This, in a nutshell, is the ambition of the critic – to find the words to relate that experience, or lack thereof (or the gray in between) to other potential consumers of said object. 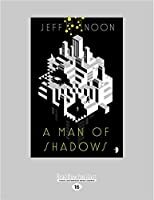 Jeff Noon’s A Man of Shadows is undeniably a work of art, and an engaging one. Expressionistic in style, though post-modern in flavor, it often feels more like a painting than a novel: confined to its subjective space but bleeding out from its boundaries and edges, willing you to look for more than it can display. Like all art objects it asks for your surrender; like many it falls just short of obtaining it. Though Noon is not usually associated with the movement known as the New Weird, A Man of Shadows, with its hybridized genres and skewed realities, fits the mold. The novel is set in some (future? Sideways?) version of our world, where the city of Dayzone exists in the perpetual light of an artificial neon sky, and the nearby city of Nocturna is shrouded in permanent darkness. Because the natural criteria for measuring time (the earth’s rotation and orbit around the sun) has essentially been banished from the two cities, everyone basically lives in their own personal timeline. In between the two cities is the shadowy (and gradually expanding) land known as Dusk, where strange people with terrifying abilities reside. The story follows private detective John Nyquist, hired to find a young runaway heiress named Eleanor Bale. Eleanor’s case appears to be connected to a serial killer known as Quicksilver, who can somehow commit his murders is plain view of spectators without being seen. Nyquist becomes obsessed with protecting (or possibly killing) Eleanor, and with unmasking the enigmatic, and probably Dusk-born, Quicksilver. In the canon of fictional detectives, Nyquist is more Hammer than Holmes (or, more persistent than clever), and as a mystery it is one of those novels that plays coy with its biggest secrets until the villain is unmasked and willingly spills the beans. Nearly every aspect of the book is immersed in Nyquist’s emotional reality. It is even suggested at one point that Dusk itself is “conjured from his own inner landscape.” I found it curious that, despite the highly subjective emotional expressionism shrouding Nyquist, I never really connected with him on a personal level. His motivations spring from a murky web of unconscious drives and pseudo-Freudian anxieties rather than anything tangibly associated with the quest he is set on. If the world of the novel really is just an exegesis of Nyquist’s own mind, this would be the most intellectually honest rabbit hole for the author to tumble down, and as a result the book is way more head than heart. So, while it may have gotten into my skull, it never got under my skin. A Man of Shadows is still an art piece worthy of admiration, if not exhalation. Thanks to Netgalley and Angry Robot for providing me with this ARC. I think this book suffered both from my misplaced expectations and a poor handling of genres. In the first case what I expected to read and what the book actually contained were rather different. Based on the description I expected a detective/noir story set in a city with one part in permanent light and the other in permanent darkness. I thought this was a cool idea and would play well into the idea of a literal dark side of a city that is metaphorically prevalent in the noir genre. There is lot I think this book suffered both from my misplaced expectations and a poor handling of genres. In the first case what I expected to read and what the book actually contained were rather different. Based on the description I expected a detective/noir story set in a city with one part in permanent light and the other in permanent darkness. I thought this was a cool idea and would play well into the idea of a literal dark side of a city that is metaphorically prevalent in the noir genre. There is lots of space in this setting to work within the noir genre and push its boundaries in cool, innovative ways. Instead of a gritty noir mystery this book contained a good deal of magical realism, a genre I am discovering I really just don't care for. Instead of a down on his luck gumshoe trying to track down a killer and save a girl (hallmarks of noir) in a realistic, if somewhat, fantastical setting I was instead presented with a magical dreamlike setting in Dusk (the growing area between the Dayzone and Nightzone of the city) where strange things happen can and do happen and where some sort of magic exists. Very little of this phenomenon is explained (thanks a lot magical realism!) and I am expected to just accept it for what the author tells me it is. This is not a thing I can do. If a book wants to present me some fantastical setting there is only so much I will accept as a premise. Half the city is bathed in a constant bright light while the other half is permanently shrouded in darkness? Sure, I can go along with that conceit for the basis of a story. But these conditions were explained and slightly explored with physical explanations given to how the city achieved this condition. Dusk (and the true driving force of the story) is left completely unexplained and takes A LOT of liberties with how reality works. There is no explanation given to why it is the way it is or behaves the way it does yet the book expected to just smile and nod at all the strange things happening. I didn't find Dusk interesting or engaging enough for me to ignore its lack of credibility. The mixing of these two genres led to the second major problem I had with the book in that I felt that neither genre was effectively handled creating both a bad noir and a bad magical realism story at the same time. On the noir front I think the biggest stumble was with the character of Nyquist. There were many aspects of this book that hit some of the high points of the genre: powerful men above the law with a shadowy agenda, family secrets that link to the wider mystery, a down on his luck gumshoe with a drinking problem who falls to far into a case, dames, etc. But where this aspect of the book stumbled was failing to deliver a suitable arc for Nyquist that made all other aspects of the genre nothing more than window dressing. Basically the entire story is of Nyquist falling harder and harder into a terrible state, be it drinking, obsession with the case and the girl in question, or time screwing up his perception to name a few. We don't get a feel for what Nyquist is like before we see him with his descent already underway so there is no baseline to compare his state to. We get some vague hints about his past but nothing that fixes in our minds what Nyquist in a good state is to contrast with how far he has fallen. Further he doesn't seem to do anything particularly smart or unexpected, he seems to be rushed forward by events instead of being proactive about figuring things out. I didn't get the sense that he was worth much as a detective which made it difficult for me to care about what he was doing. In the end this book failed on the noir front because it did not properly frame the main character in a way that allowed the reader to put him in the proper context. On the magical realism front, well, maybe it's that I just don't like the genre. I prefer my fantasy to be somewhat explained and not forced to accept it as is. For instance, in Lord of the Rings we are told why Sauron wanted the ring and why it was important. Not everything has to be explained (like why are there giant eagles? There just are, accept it as a small part of the story and move on) but the important things, the things that drive the entire plot of the book and exist in an otherwise realistic and rational world, need to be explained or else the story doesn't make any sense. Why did Dusk exist and why was it so different form the rest of reality? This is never explained but in a world with at least an understanding and appreciation of science and the ability to KEEP AN ENTIRE CITY IN PERPETUAL LIGHT I would have expected A LOT more interest shown in studying Dusk since it was also a threat to said city. The fact that it is just treated as this thing that is out there and dangerous and no one seems to pay it any mind save for avoiding it struck me as completely unbelievable. Compound that with unexplained magic in an otherwise realistic world and the story really suffers in my eyes. It would be one thing if Dusk was a minor part of the plot and its inexplicable presence and characteristics remained relatively sequestered from the main storyline but the last third of the book directly dealt with it and its consequences. The story put the poorly explained fantasy center stage and expected it to hold the weight of the narrative. This it could not do and each successive page added further to the amount of material the reader just had to accept instead of building on past explanations or reasonable foundations. By the end I begrudgingly accepted what the story offered just so I could get to the end of the book. This poorly realized magic realism aspect of the book collapsed under the spotlight and dragged the story down with it. Now there were some interesting aspects of the book: the idea of people buying and living on different timelines, the dichotomy of the city and all the consequences of that, the neighborhoods within the different city spaces were neat and interesting. But the heart of the book, the fusing of noir and magical realism, was just a poorly executed mess and wasted so much potential of the setting and the story. So really your enjoyment (or lack there of) for this book will come down to how you view genre conventions because I could see how some readers could really enjoy the book. It just didn't work for me. Ugh, Jeff Noon. Dammit. He's never lived up to his first two novels. I loved Vurt, one of the earliest cyberpunk novels, and Pollen, a tripped out cyber-environmental apocalypse. But I was meh on Automated Alice and Nymphomation. I actively disliked A Man of Shadows. Ostensibly, a science-fictional/fantasy noir detective story, it falls down on all accounts. The main character, the detective, is a sad sack. A rather pathetic failure who gets beat up a lot and only succeeds by accident. At times, Ugh, Jeff Noon. Dammit. He's never lived up to his first two novels. I loved Vurt, one of the earliest cyberpunk novels, and Pollen, a tripped out cyber-environmental apocalypse. But I was meh on Automated Alice and Nymphomation. I actively disliked A Man of Shadows. Ostensibly, a science-fictional/fantasy noir detective story, it falls down on all accounts. The main character, the detective, is a sad sack. A rather pathetic failure who gets beat up a lot and only succeeds by accident. At times, his actions are also kind of creepy toward the female lead he is attempting to rescue, a teenager, and that makes him even less appealing and less sympathetic. He is all-around unlikable. The physical environment and tone of the story is excessively gloomy. Dark is one thing. But gloomy and mopey is boooo-ring. The story takes place between two cities and the border between them. One of them is called Dayzone, with artificial lights of all kinds hung from some kind of overhead electrical lines entirely blocking out the sky. And Nocturna, where everything is dark. And the dusk zone between them, which is filled with fog and smoke and is intended to be spooky. There is also this commercialization and commoditization of "timelines" within these cities, where various corporations or individuals can buy and establish different timezones for themselves, and you have to adjust your watch constantly as you go from one place to another. Residents can develop a sort of mental time-sickness if they become too confused and thrown off-balance by constantly changing time-zones. All of this is interesting from a creative perspective, but from a science fiction perspective it made very little sense. It's more of a gimmicky way for society to evolve than one with coherence. The quirkiness of this construct makes very little sense from an economic perspective. Obviously, a city with a sky of artificial light would be burning tremendous amounts of money on energy versus one that had none. Particularly illogical is the proliferation of individual and branded (for sale) timelines. Dividing the day up into hours, minutes and seconds and universalizing it is an aspect of economic conformity and commoditization. Slaves of course did not need time, they were always on call. Farmers and hunters follow the rhythm of the sun and nature. Once you have "employees" you need them to show up at specific times for specific periods to use their labor for profit. Allowing people to run on their own individual timelines would utterly destroy this capitalistic system. Who would hire an employee that interprets 9am as being his noon? Or who adjusts her hours to run twice as long when she is at home? After a re-read..I loved this novel. Originally a 3.5* but Noon at his best!! What a strange and weird rollercoaster ride. This blend of detecitve street noir with new weird scifi world buidling creates a completely new type of experience for the reader. Its not as quirky as Vurt but very close. Two cities each different in their own way but the distinguishing feature is the daylight and perpetual darkness of them both. Time is a currency of sorts, and this has a huge influence on the themes and After a re-read..I loved this novel. Originally a 3.5* but Noon at his best!! I really will never look at time passing in the same way again. Sometimes a book comes along that just ticks every box in the “things I love about reading” stakes – A Man of Shadows is such a novel, so incredibly immersive, such brilliantly incisive descriptive prose and a set of fascinating, beautifully imagined characters – that you just dive into it with abandon and leave the real world behind. A Man of Shadows has a decisively built world, a world of literal light dark and shade, where time is I really will never look at time passing in the same way again. 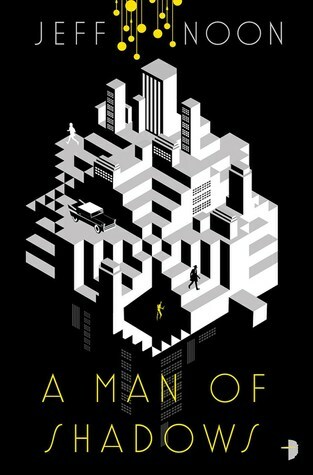 A Man of Shadows has a decisively built world, a world of literal light dark and shade, where time is of the essence and the residents live with a kind of permanent jetlag as they jump between one timepiece and another. Into this strangely authentic place we find John Nvquist, Private Eye, damaged individual, hunting for a missing teenager and becoming entangled in a dark and dangerous web. He is quintessentially of the 1940’s, the wonderful noir feel the author brings to proceedings is quite simply incredible considering the scifi setting and the increasingly bizarre yet compelling narrative – the dialogue is of another age yet sparkles against the advanced backdrop, all the way through this strange beauty echoes in your mind, you do live it and breathe it. A Man of Shadows is a heady mix of science fiction, old school detective noir, horror and thriller – I was almost literally holding my breath as the final moments unfolded and I have no doubt there are some surreal dusk fuelled dreams awaiting me when I sleep tonight – I almost welcome them, so much did I enjoy this one that despite the dark nature of it I’d love to return. Oh look – this is John Nvquist 1 apparently – so I guess I should be careful what I wish for. Surreal, dazzling, unusual and extraordinary – A Man Of Shadows will haunt you for a long time after turning that last page. Fact: I don't like noir fiction for the most part. I loved this. The best noir I've ever read . Fact: I generally like character driven stories. This is completely world driven. The characters are merely a conduit for which to experience this vivid, original, amazing and very strange world. Usually I can hate characters and that's as good as liking them. By the end I did embrace the two main characters but only because the world drew me into them. Fact: This is the most original world and story s Fact: I don't like noir fiction for the most part. I loved this. The best noir I've ever read . Fact: This is the most original world and story since Beyond Redemption. Fact: Not everybody will like this. The story and the world are very abstract and strange. It's sort of like taking Harry Bosch, The Naked Lunch, The Time Machine and a pinch of Malazan (Dark, Dusk and Light) and shaking them up into a acid trip cocktail. I really don't want to get into the plot and the world too much and ruin it so I'll just say the book revolves around different elements of time, space, dark, light and dusk with a lot of metaphores for day to day life. This takes place in an alternate reality of the late 1950's and there's a culture that revolves around both the conformity of that decade and the drug decadance of the following decade. If you're looking for something off the wall and different this is the book for you. If you're not a fan of an acid trip style book it probably isn't. I just recently learned the term "new weird" fiction, but I think it can be applied to this book. It's sci-fi, horror, urban fantasy and detective noir, so there's a lot going on here. John Henry Nyquist is a private detective looking for the missing 18 year old Eleanor Bale. Robert Mitchum could have played Nyquist in the movie. It turns out that Eleanor is not just a runaway, she plays an important role in the very strange world created by the author. The action takes place in a city comprised I just recently learned the term "new weird" fiction, but I think it can be applied to this book. It's sci-fi, horror, urban fantasy and detective noir, so there's a lot going on here. John Henry Nyquist is a private detective looking for the missing 18 year old Eleanor Bale. Robert Mitchum could have played Nyquist in the movie. It turns out that Eleanor is not just a runaway, she plays an important role in the very strange world created by the author. The action takes place in a city comprised of three parts. Dayzone is always light, lit by millions of light bulbs at all times. Nocturna is always dark and to go between these two parts of the city you must go through Dusk, which is a no man's land that is best avoided. In each of the parts of the city, time is a distinctly relative concept. Time zones are personalized. Nothing about any part of this city makes it an appealing place to live, and one problem I had with the book is that the author never explained why anyone would choose to live there when the rest of the country appeared to be "normal". Another problem I had with the book is that the difficulties faced by Nyquist and Eleanor could have been eliminated by a little truth in the beginning, but then you wouldn't have had a book. The truth begins to be told at about the 80% point. Up until then you get a serial killer, fog men, a drug that distorts time even more than this city does, and a lot of situations that made me wonder whether everyone was just mad and imagining the whole thing. This was a well written and imaginative book and I'd like to read more by this author. A sci-fi thriller of sorts. Interesting if slightly confusing ideas and ultimately too much of a narrative on the world created rather than on telling the story left me cold. The story takes place in a city made up of three distinct parts - Dayzone, which is permanently bright thanks to the billions of neon lights covering the area, Nocturna, which is permanently dark and Dusk, which seperetaes the two areas, a type of no mans land which is avoided at all costs, neither light nor dark and covere A sci-fi thriller of sorts. Interesting if slightly confusing ideas and ultimately too much of a narrative on the world created rather than on telling the story left me cold. The story takes place in a city made up of three distinct parts - Dayzone, which is permanently bright thanks to the billions of neon lights covering the area, Nocturna, which is permanently dark and Dusk, which seperetaes the two areas, a type of no mans land which is avoided at all costs, neither light nor dark and covered in fog. The city has numerous time zones. Companies work to their own time zones. More and more time zones are becoming available and being sold by private corporations. Our main protagonist is a Private Detective called John Nyquist, a washed up heavy drinking man, confused and weary from the numerous time zones and their constant changing as he moves across the city. He is hired by the head of the biggest corporation that develope and sell these different time zones, to try and find his runaway daughter. That's the basic premise of the story and as it developes we are introduced to a serial killer that can kill in broad daylight without anyone seeing him, street drugs that can alter time and let you see into the future and some ghostly elements thrown in for good measure. So, I didn't really enjoy this book. The story felt like it took an age to tell. The descriptive narrative of the city continuously interrupted the flow of the story progressing. Yes it's a sci-fi novel with a surreal city but, just as the story is moving along we get pages of descriptive prose of the surroundings etc. It just left me cold. The characters were just smothered by this and as a result played second fiddle and were extremely two dimensional. Nyquist, our main character is literally nondescript and therefore held little or no interest. The second half of the book is certainly better than the first. The story did move along and there chapters of real interest and page turning elements as you were finally sucked into the story. But that didn't last ultimately as the descriptive prose took over again and all momentum of the story was lost. The ironic thing is, with so much time spent by the author describing the world and its workings, so much wasn't really explained and many elements just vaguely gone through, not really making sense to the reader. There are some really interesting ideas here but the vagueness with which they are executed left me cold on the whole world the book inhabits. The story seemed to play second fiddle to the surroundings. In the end it was a bit of a chore to finish this one. Not one for me I'm afraid. Thanks to NetGalley for an ARC. It starts out as a hard-boiled detective story set in a world that feels like a futuristic version of the 1950's. The city is split into three different zones, Nocturna that is eternal night, Dusk, a place of fog and monsters where it is always twilight and no-one dare go, and Dayzone, a world of bright neon lights where it never I read once that taking away watches and clocks from people and not allowing them to know the time will slowly drive them mad. After reading this book I can believe it. A Man of Shadows by John Nyquist is a terrific summer science fiction read. I absolutely loved it and had a blast with this one. An awesome start to a series. "Time, time, time/See what's become of me"
While reading A Man of Shadows I found myself becoming wary of every timepiece in my house. Why does the microwave clock read 11:45 when the oven clock reads 10:32 and the wall clock reads 2:55? Which is th correct time? If I call the speaking clock number will anyone answer? Can anyone tell me "at the tone the time will be..." or am I on my own? Who decides what time it is for me? In short this book has caused me a great deal of anxiety. With a major bir "Time, time, time/See what's become of me"
In short this book has caused me a great deal of anxiety. With a major birthday looming soon I find myself fretting over the passing of time, current time, future time, how many minutes I have left in this lifetime etc. John Nyquist was also running away from time but simultaneously running towards a certain time. Once again Jeff Noon serves up a major mindfuck disguised as a story. Don't get me wrong, this book is fantastic and the story is gripping and well done. Maybe too much so. Part hardboiled derivative story, part noir, part speculative fiction, part literary acid trip etc. Even now looking at the window at what appears to be sunlight I wonder if this light is actually sunlight or if bulb monkeys are somewheee high above me replacing bulbs. When dusk comes will it bring along a foggy mist? Is the impending darkness truly nighttime or am I just on an alternative timeline? A wonderful blend of sci-fi and mystery with a noir feel. Jeff Noon is a master of descriptive prose. Intricate writing and vivid depictions bring the complex world to life. Its dark, disturbing with plenty of bizareness thrown into the mix. Amazing world building in a city where time is a commodity and citizens move from one time to another adjusting their wristwatches to match one of the different timelines on offer. The city is split into 3 zones: Dayzone where darkness has been banished by b A wonderful blend of sci-fi and mystery with a noir feel. Jeff Noon is a master of descriptive prose. Intricate writing and vivid depictions bring the complex world to life. Its dark, disturbing with plenty of bizareness thrown into the mix. Amazing world building in a city where time is a commodity and citizens move from one time to another adjusting their wristwatches to match one of the different timelines on offer. The city is split into 3 zones: Dayzone where darkness has been banished by billions of light sources and it is always bright. Nocturna where darkness lives. And the area in between which people refer to as Dusk where it is rumoured ghosts, shadows and dark shapes live within the mist. I have been a fan of Jeff Noon ever since his debut novel, VURT, from 1993. Noon's latest novel is a noir detective thriller, set in a city divided into two zones, Dayzone, where it is always bright daylight. and Nocturna, where it is always nighttime. In both cases we have artificial day and night: Dayzone is lit with so much artificial light, bulbs and neon lights and whatever, that you cannot see the sky at all -- it is huamn-made illumination however high up you go. Nocturna also seems to be I have been a fan of Jeff Noon ever since his debut novel, VURT, from 1993. Noon's latest novel is a noir detective thriller, set in a city divided into two zones, Dayzone, where it is always bright daylight. and Nocturna, where it is always nighttime. In both cases we have artificial day and night: Dayzone is lit with so much artificial light, bulbs and neon lights and whatever, that you cannot see the sky at all -- it is huamn-made illumination however high up you go. Nocturna also seems to be domed away from the sky; bulbs high up are like stars, making for artificial constellations. Between these two main regions is the ambiguous realm of Dusk, an area of ambiguity, of mist and shadows and diffuse artificial moonlight, where it is dangerous to go. People who enter Dusk are most often never seen again. Trains traverse the Dusk as they shuttle people between Dayzone and Nocturna, but the trains never stop in Dusk itself. A Man of Shadows is about day and night, or light and darkness; but it is also about time. There are multiple time streams in Dayzone and in Nocturna -- every activity and every place seems to have a different time. People are always manically switching the time on their watches and clocks, in order to keep up with whatever region they are in, or whatever activity they are following. In Dayzone, the incessant light supposedly boosts industrial productivity; everyone is always busy and nobody gets enough sleep -- nobody even knows when it is time to sleep. Rest and sleep are possible in Nocturna, but there are also plenty of nighttime activities -- bars and clubs and the like -- as well as mysterious zones where it is always midnight, so time barely seems to pass at all. The novel's protagonist, John Nyquist, is a down and out detective drawn straight from the realms of film noir. He is hired by the richest man in Dayzone to find his missing daughter, and from there he is drawn into ever-deeper regions of mystery and ambiguity. I won't go into the plot in detail, but suffice it to say that Nyquist discovers the seamy underside both of Dayzone's frantic capitalist activity, and of Nocturna's hidden underworld. There are mysterious illicit drugs that alter your sense of time, murders by an invisible killer that turns out to involve time theft, and art works that expand or contract light and shadow, time and stasis. Nyquist struggles to figure out what is going on, and to rescue the young woman Eleanor who seems to be in danger from her involvement in all these activities, at the same time that he struggles through his own neurotic difficulties. The threat of a "time crash" -- sort of like the financial crisis of 2008, but involving everyone's existential sense of duration (since after all, time is money) hangs over everything. I don’t know how to describe this book because I feel there are two potential stories here and the way they were blended together left me confused and a little underwhelmed. My main issue with this book stems from the feeling that there were two different worlds, or, I don’t know, major story elements maybe, that belonged in two different books. There is one world with the cities of Dayzone, Nocturna and Dusk (that apparently reside in a seemingly n This review and others posted over at my blog. My main issue with this book stems from the feeling that there were two different worlds, or, I don’t know, major story elements maybe, that belonged in two different books. There is one world with the cities of Dayzone, Nocturna and Dusk (that apparently reside in a seemingly normal world that has a regular 24-hour day/night cycle) and another world where everyone can live in their own time stream. I found the concept of a city of constant day and one of constant night (and the mysterious, ghostly realm of Dusk) an interesting one and I wanted to know more about how these cities came to be. Many residents of Dayzone seem borderline obsessed with the endless light and heat – as much as I love the sun and being warm, I don’t think I could handle it all day every day. I wouldn’t care to live in the dark either and the city of Dusk is unknown to many. These three cities blended together to create an excellent setting for a sci-fi novel. Then the different time zones come crashing in and wreck everything. There was nothing in the book’s description that led me to believe there would also be timey-wimey details to mess with my head. People can buy different time streams/zones to live in and somehow switch between them whenever they want? And different companies or sections of the cities run on their own time zones? And there are even time crashes (like stock market crashes maybe?) that can drive people insane. What drove me insane was not knowing how any of that worked. Nyquist was constantly changing his watch to match whatever time of whatever building he was in and I didn’t see why any time matters if you can just constantly adjust your watch. The mixture of the day and night zones and the endless switching of times gave this book a dreamlike feel. Sometimes that works for me, but in this case it didn’t. I was incredibly confused. Near the halfway point I decided to glaze over any details regarding the switching of times or Nyquist’s confusion about what time it was (which was pretty much constant – I mean, how could anyone function like that? Why have time at all!?) so I could focus on the mystery aspect. That didn’t do much for me either. Nyquist is your typical alcoholic, down-on-his-luck, divorced detective who gets in over his head. I normally don’t mind that cliché if the character has some substance but Nyquist fell flat for me. None of the other characters really made an impression on me and when the convoluted ending came along I was so over everything. I don’t actually understand what happened in the end or how the story was resolved and I really don’t care. This book was a disappointment – I thought I’d be instantly in love and I wasn’t even eventually in love. I hate to say it, but I almost think this would be better as a movie – shortened and simplified a bit. I wonder what it would be like if the different timelines had been left out and the focus kept on the two cities…alas, I’ll never know. If you’re a fan of sci-fi that focuses on time and detective novels, you might enjoy this. Maybe you’ll understand it a hell of a lot better than I did! This story was visually stunning. It would make a beautiful movie. I'd love to see Guillermo Del Toro take it on! It has this incredible science-fiction world building, combined with a hard-boiled detective story and a super-eerie sort of otherworldly horror. Engrossing. La primera novela de este nuevo detective en un escenario que recuerda a La Ciudad y La Ciudad de Mieville tiene muchos defectos (un personaje poco carismatico, una ciudad algo desaprovechada a pesar de que se intuye muy interesante, etc.) pero resulta entretenida para quien no busque mas que pasar paginas entretenido por un misterio hasta al ultima pagina. This is the worst book I've ever read. Literally. I've started worse books, but given up... but this one I stuck with to the bitter, meandering, pointless end. It is bad on so many levels. Awkward punctuation, sentences spliced together with straining commas. Bale pleaded with her. "Please..."! No subtle demonstration of characters feelings and motivations. Nope. Just statements that don't fit the scene/character. Inconsistent characters. All are normal one minute and crazy the n This is the worst book I've ever read. Literally. Inconsistent characters. All are normal one minute and crazy the next (not demonstrably crazy - we're just told they are). If you like sci fi, avoid it. It's not sci fi. It's mystical magic stuff. If you like crime/mystery, avoid it. There's nothing to figure out. The main character has no purpose. He simply bumbles around randomly doing unmotivated things. And then we find out it's all magical nonsense anyway. This review has been hidden because it contains spoilers. To view it, click here. I love Noon but his most recent work feels like his weakest. :( The city's light, dark, and dusk zones were interesting but the idea of corporate and personal timezones just didn't make any logical sense, and seemed like a hindrance rather than any societal advantage. The inevitable conflict with the timezone stuff was really anticlimactic and given as only an afterthought in the epilogue. The main character would have been interesting if this was an older book, but really the hard-hearted cynic I love Noon but his most recent work feels like his weakest. :( The city's light, dark, and dusk zones were interesting but the idea of corporate and personal timezones just didn't make any logical sense, and seemed like a hindrance rather than any societal advantage. The inevitable conflict with the timezone stuff was really anticlimactic and given as only an afterthought in the epilogue. The main character would have been interesting if this was an older book, but really the hard-hearted cynical drunkern detective noir character trope is boring and predictable. I found this trope recently in _Leviathan Wakes_, but at least in that book you got really into the character's head, he was charming as you became familiar with him, and he evolved. However, John Nyquist is the stereotype and he doesn't really evolve: he's a cynic who looks for alcohol in every new building he enters. He tracks down the missing girl Eleanor, loses her after only a bit of dialogue, and then this same pattern happens *twice* again after (the initial encounter, the apartment, the theatre). And yet despite this, he becomes super invested in the case even though he openly doesn't care about her as a person, often giving her soft torment and other times just telling her to shut up. Yet he's then willing to risk his life to save her, even though he's *very* easily persuaded to change his mind at one point (and really without reason - he later wants to kill her only because he's been shown a vision of him doing so). She later acts quite close to John despite constantly running away from him and really only meeting him three brief times before the third act. And the best portions of the book - set in the third act within the mysterious Dusk area - are reminiscent of the world of _Vurt_ with the surreal atmosphere of _Falling out of Cars_... until a lot of the most important moments happen "off-screen" as characters are shrouded in the Dusk away from him. At one point, despite being on a time-sensitive mission, he literally just goes for a nap and when he awakens the plot has to *find him* instead. This is after Aisha mocks him, saying that he will never find the girls he's looking for... but a quick sleep in the right room sorted that right out. I realise this is book one in a planned series, but I'm unsure of how it could best continue: by the end it seems like the morally-ambiguous character of Eliza is left to wander the Dusk world... but in peace? to die? to continue the spread of the Dusk world? Will we even find out, since the central character Nyquist has now left the city and seems quite adamant to never return? From what we saw, it seems like Eleanor gave up some of her life to make her sister stronger, but as she still resides in the Dusk as is producing more of it with every breath, is the whole city still in danger of being taken over? The main characters don't seem to care once they escape. It got to a point where, during the third act, I realised this book could have been a lot better if told from Eleanor's perspective, if we untraveled everything with her and got in her head during her transformative moments. I think this book's theme was about "purpose", and that theme was best found explored with the characters of Eleanor (in the second half of the book), Patrick, Kinkaid, Aisha, and Eliza. Nyquist too, found purpose in the case, and I think that was his primary motivation, but really the theme was explored better with the other characters I just listed, and they are all linked by family connections, and maybe the book should have just stayed within that family, with no need for Nyquist stumbling around between them. I love you Noon and I look forward to future work but this one didn't hit me like your offer offerings. Interesting premise and setting, but the writing is terrible and I don't think anyone on the writing or editing team has ever heard of show, don't tell. Also, there are no likeable characters. Maybe that's the point, but then it's just not for me. Extremely clever and thought-provoking, especially during the first half. I tried really hard to finish it, but in the end I gave up with only 50 pages to go. It was a combination of things really: as a fan of Vurt and Pixeljuice, I was rather looking forward to Noon's crazy drug-infused style. Instead what I got was something disappointingly sober. This is not the Jeff Noon of yesteryears and I understand people can change their style, however I really felt cheated in a way. The story itself in theory should have worked, I loved the idea of Dayzone, the Dusk and Noct I tried really hard to finish it, but in the end I gave up with only 50 pages to go. It was a combination of things really: as a fan of Vurt and Pixeljuice, I was rather looking forward to Noon's crazy drug-infused style. Instead what I got was something disappointingly sober. This is not the Jeff Noon of yesteryears and I understand people can change their style, however I really felt cheated in a way. The story itself in theory should have worked, I loved the idea of Dayzone, the Dusk and Nocturna and the mythology behind it was brilliant. However it was a question of 'execution' and wrong style for me. Noon should have kept to his style and not altered it for this. Another factor for me was simply that i didn't care enough about the main character, nor Eleanor Bale. In fact the ending felt too drawn out and I could just see by the direction of the story that maybe Noon had written himself into a bit of a corner. Nothing impactful could come of it, and I needed a pay off - something that was going to make me think I had persevered for something. Well, whatever happened to Bale is something I will never know and have no desire knowing. Having said all this however, I do think this story may end up one day becoming a TV series. And then it might actually shine. It's a bit like Gaiman's American Gods: hard to read (a jumpy narrative and a huge cast that you can't really follow too well) but it has quickly become a cult classic on Amazon Prime. This one's tough to put a star rating on, but I'll have to give it three rather than two. I certainly didn't dislike it, and read it through happily enough, but it's one of those books that feels like a missed opportunity. The setting is terrific: a city divided into Dayzone and Nocturna, with Dusk as a limbo in-between zone. Dayzone is always lit, while in Nocturna it's always night, and in both time is mutable, with different timelines created and sold on a whim so everyone is constantly setti This one's tough to put a star rating on, but I'll have to give it three rather than two. I certainly didn't dislike it, and read it through happily enough, but it's one of those books that feels like a missed opportunity. The setting is terrific: a city divided into Dayzone and Nocturna, with Dusk as a limbo in-between zone. Dayzone is always lit, while in Nocturna it's always night, and in both time is mutable, with different timelines created and sold on a whim so everyone is constantly setting their watches as they change environs. Noon's always reliable for an imaginative experience. The main character, private investigator John Nyquist, is a confused, semi-broken man, and unfortunately a somewhat aggravating protagonist to follow through the book. We learn his background and I felt for him, but he seems to have only two modes that he flips between: fear and anger. His responses are thus predictable in every situation. I liked several of Jeff Noon's previous books, and persevered through this one because of a good review in Asimov's Magazine. But I didn't like it. Yes, there's a noir detective tale in there, which eventually comes to an actual resolution, thus two stars rather than one. And the world is built on some interesting premises about time and about light, dark, and in between. It's surreal; I kept thinking of the Dali painting of the melting watch. But the book seems more about style than substance, I liked several of Jeff Noon's previous books, and persevered through this one because of a good review in Asimov's Magazine. But I didn't like it. Yes, there's a noir detective tale in there, which eventually comes to an actual resolution, thus two stars rather than one. And the world is built on some interesting premises about time and about light, dark, and in between. It's surreal; I kept thinking of the Dali painting of the melting watch. This is a dark, noir, crazily inventive, weird science fiction book. Nyquist is a detective (rather by the numbers sadly, drunk, pursuing a case no matter what even though we don't know why, a total mess) who lives in a strange city of three parts. One, the Dayzone, forever cast in artificial light, another Nocturna, where it is permanently dark and fake constellations show people the way home, and another the mysterious Dusk, where people can hardly take one footstep after another without going This is a dark, noir, crazily inventive, weird science fiction book. Nyquist is a detective (rather by the numbers sadly, drunk, pursuing a case no matter what even though we don't know why, a total mess) who lives in a strange city of three parts. One, the Dayzone, forever cast in artificial light, another Nocturna, where it is permanently dark and fake constellations show people the way home, and another the mysterious Dusk, where people can hardly take one footstep after another without going completely mad. He is ruled, as if everyone else, by time - in this city there are probably thousands of different timezones you can choose to live in/by. It's a fascinating world, beautifully described - so much so that at times the story feels a little lost behind the description. I was hard pushed at times to keep on reading. It felt easier to put the book down and clear my head a little. Nyquist is often confused and, like dusk in the book, it sort of spreads to the reader. I was more interested in the girl he is hired to find - Eleanor Bale - but she is mostly a figure in the distance, always out of reach and barely knowable. I persevered and eventually was able to let the stuff about timezones and lights wash over me, and by about 60 per cent of the way in I discovered the plot. But my, it was tough getting there. A Man of Shadows is a stellar blend of noir, fantasy, and science fiction. The world that Jeff Noon created for this novel is fascinating and disturbing at the same time, and it draws you in, wanting to know more and more details of how things work. Most notably, the novel's structure works firmly within noir tropes, but somehow never devolves into cliche, rather utilizing the fantasy elements to make them seem somehow new again. And as with all the best noir, the central protagonist, while deepl A Man of Shadows is a stellar blend of noir, fantasy, and science fiction. The world that Jeff Noon created for this novel is fascinating and disturbing at the same time, and it draws you in, wanting to know more and more details of how things work. Most notably, the novel's structure works firmly within noir tropes, but somehow never devolves into cliche, rather utilizing the fantasy elements to make them seem somehow new again. And as with all the best noir, the central protagonist, while deeply flawed, is a beaten down man who deserves much more, if only he can accept it himself. This book has fallen and I can't pick it back up. DNF 35%. I think it's a perfectly fine book but it didn't grip me and after I set it down I just couldn't be bothered to pick it back up again. I kept telling myself I'd be back but, life is short and the library well stocked. I liked the world and was quite interested in finding out more about all these different timelines, but it didn't come or I lost interest before it did.